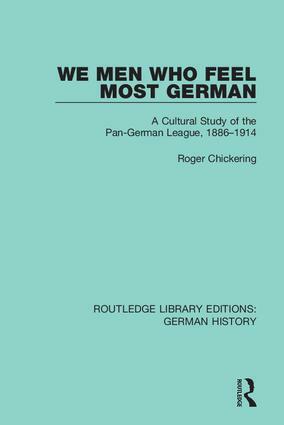 Originally published in 1984 this volume presents the first systematic analysis of the cultural sources of the Pan German League’s appeal and influence in Imperial Germany. It focuses on the symbolic dimensions of the League’s literature and activities, in order to explain the attraction of the League’s aggressive ideology to certain social groups. In addition it examines the relationship between the League and other patriotic societies in Imperial Germany and analyses the processes by which the organization succeeded, on the eve of the First World War, in mobilizing a broad ‘national opposition’ to the German government. The study draws on concepts from psychology and anthropology, and its documentary foundation includes archival material from both the former East and West Germany. 1. The Country: Its Peoples and Its Language Jethro Bithell 2. German History to 1618 Kathleen M. Gadd 3. German History from 1618 to 1900 William Harbutt Dawson 4. German History from 12900-1931 Hugh Quigley 5. German History from 1931 – 1937 Jethro Bithell 6. German History from 1937 - 1952 Elizabeth Wiskemann 7. German Literature to 1748 W. E. Collinson 8. German Literature from 1748-1805 F. E. Sandbach 9. German Literature from 1805 – 1880 L. A. Willoughby 10. German Literature from 1880 – 1954 Jethro Bithell 11. German Thought Rudolf Majut 12. German Music Edwin Evans and Mosco Carner 13. German Painting Hannah Priebsch Closs 14. German Architecture and Sculpture Martin S. Briggs. Bibliographies to Each Chapter.